Listed alphabetically by first name, since we revere them all equally!! Rescuing cats and kittens is something that our family has wanted to do for a long time. 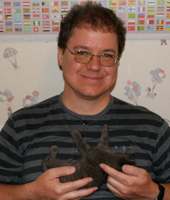 We have always loved cats and have had numerous cats adopt us through the years. We have spade/neutered many strays and taken care of a feral colony of cats close to our home. We have 9 cats of our own and wanted to do something to help save as many cats as possible. In the process of spay/neutering the feral cats in our neighborhood we ran into Lisa who was a teacher for my kids many years ago. When I found out that she had founded Unconditional Love I immediately volunteered to foster for her. I was impressed with the quality of care the foster cats receive. They are fed the healthiest of foods and all their medical needs are taken care of. Unconditional Love does not shy away from taking hard to place cats or those with special needs. We are in our 3rd year of fostering for Unconditional Love. We have had over 50 cats/kittens in our care. 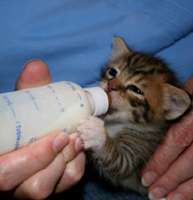 We’ve bottle fed numerous baby kittens some as young as a 1 week old. This all has been done with the love and support of my daughter Paige, husband Dale and many members of our extended family. They are the ones who routinely do the morning feedings while I am off early to work. 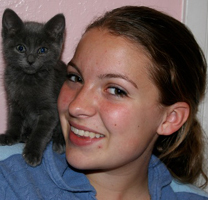 Their love and dedication to our always changing variety of fosters has made this a rewarding experience for us all. We have remodeled a spare bedroom into a “cat room”. It is in that room that we play and love our little ones. We have learned how beautiful and smart cats are. We have been in awe of our mother cats and the care they take in nurturing their babies. We have learned how much fun it is to do the “right thing” and how much our life is enhanced through taking care of those who can’t take care of themselves. My daughter Paige has written school papers on the importance of having your pet spade or neutered. Each litter of kittens we foster is even more adorable than the previous litter. There have been many tears of sadness and happiness as each cat/kitten has found their forever home. It is sad to see them go because they have become such a part of our family but we are grateful when they are adopted by people that can give them the love and attention that they need and deserve. 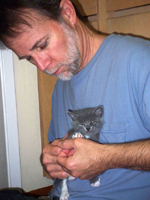 Bev Canon--Saving Kitties via Fostering Simply Not Enough . . .
Bev has been a dedicated volunteer at the San Jose Animal Care Center since it opened. Whether it means cleaning cages, snuggling kitties, walking dogs, or offering to foster kitties who have no chance at survival, Bev always steps up and does more than is expected of her. So when Bev inquired about fostering for us, we were excited beyond words. 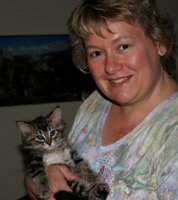 Bev is pictured with her current foster kitty, Angel - a mama of five (who Bev also fostered)! We are now excited to announce that Bev is fostering her last litter for our organization. Why, you ask? Well, Bev and her family have formed their own non-profit animal rescue and will be helping rescues like us save more animals!! Bev's rescue organization is called Friends4Pets and will be up and running shortly. We cannot begin to express our admiration and appreciation for people like Bev, who could easily turn their heads and ignore the problem of animal overpopulation. Instead, she is jumping into the fray, walking the walk, and being part of the solution. Bravo, Bev!! Carolyn & Mike – “Graduating” Class A Kitties! I started fostering because we lost a beloved pet of nineteen years. I simply had to get in touch with cats again! Lisa at Unconditional Love was the first to answer my volunteer inquiry, and I'm so glad she did -- her dedication to this work constantly amazes me, and her outlook and attitude make her a joy to be around. As for me, let's face it, I'm in it for the fun! Who wouldn't want to play with kittens all day long? It's fascinating to watch them develop new skills every day. And it's a great bonus to know that all these babies will get to grow up and have great lives of their own while enriching the lives of their forever families. Sure, it's tough to see them go when the time comes, but I keep reminding myself that they won't be tiny forever and I can't keep 100 full-grown cats! And I always know that Lisa has found the perfect home for every single kitten. When I have to say goodbye, I picture each one in a little cap and gown, graduating from school, going off to make his mark in the world; and that makes me smile! Dr. Hanney is a beloved friend and veterinarian of Unconditional Love Animal Rescue: not only does she care for our little ones like they are her own, she has actually ADOPTED two of our little ones into her family (Knuckles and Buck Stryker, affectionately known as "Knuck and Buck")! Dr. Hanney has consistently gone above and beyond for kittens that we have taken to the Cat Hospital: when the veterinary work is done, she will often snuggle and socialize little ones we sometimes board there, which usually means carrying them around in her smock pockets!! Unconditional Love adores Dr. Hanney and highly recommends her! !